A boy checks out an electric powered farm tractor during a demonstration at The University of Oregon. The familiar noisy and exhaust-spewing sights, sounds and smells of the traditional gas or diesel-powered farm tractors may one day be a thing of the past. As the technology improves and electric tractors hit the market, more and more growers are turning to machines fueled by wind or sun. What is an electric tractor? Traditional tractors are powered by engines fueled by either diesel or gasoline and have transmissions powered with hydraulic fluids. But electronic tractors are different. They are powered by a series of electronic batteries that can be recharged simply by plugging them in to a standard socket. 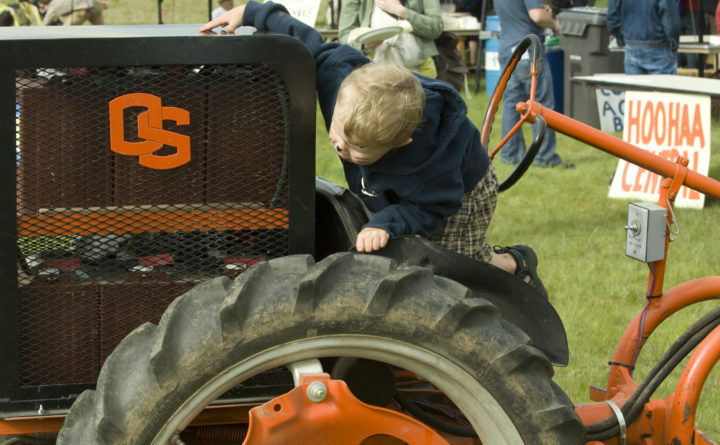 An electronic tractor was a popular attraction at an Oregon State University demonstration. The batter-powered farm tractors are popular in Europe and have a growing following in this country. Tractors that run off electrical batteries require no fluids, which means an end to filling fuel tanks, checking oil, adding hydraulic fuel or changing filters. With far fewer moving motorized parts than a traditional tractor, the electric machines can outlive their gas and diesel-fueled counterparts and are far less expensive to maintain, Kanitz said. The Maine Organic Farmers and Gardeners Association operates two electric tractors on its farm in Unity, Maine. One of the tractors was converted from a gas-powered machine to all electric by MOFGA’s building and ground director Jason Tessier. The electric-powered tractor used on the farm at the Maine Organic Farmers and Gardeners Association is safely tucked away in a barn and waiting for spring. The tractor was built and converted to all battery-power by the late MOFGA member John Howe and donated to the group by his son Ed Howe. This second tractor is an actual manufactured electric model, not a retrofit. Tessier hopes to incorporate that tractor into general MOFGA farm use this coming year and is cautiously optimistic on the overall future of electric tractors. 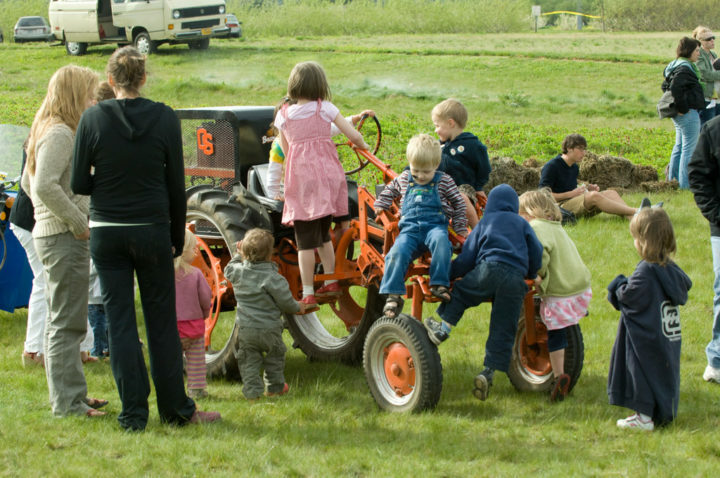 In 2009 Chris Jagger of Blue Fox Farm in southern Oregon converted his 1940s era Allis-Chalmers Model G tractor from diesel power to electrically powered to use on his organic farm. Jagger expanded his five-acre gardens to a 30-acre operation six years ago, he said, and at the time the battery technology available for his tractor could not hold a charge long enough to keep up with the increased workload. The late Maine Organic Farmers and Gardeners Association member John Howe converted this tractor to electric power. His son donated the machine to MOFGA where it is used as a demonstration model and on the farm. 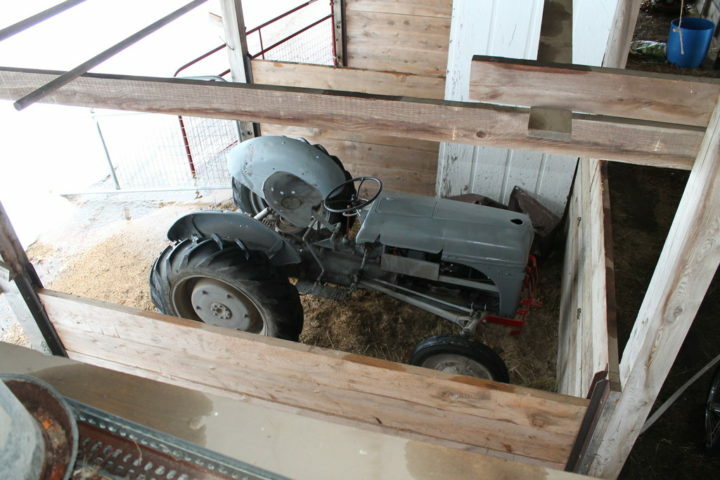 Jagger’s old electric tractor is still in use, he said, at a smaller farm near his operation. Jagger said he’s keeping an eye on the new technology and hopes to one day bring an electric powered tractor back to Blue Fox Farm. Kanitz said the electric tractors are already in heavy use in European countries. Large tractor manufacturers like Allis Chalmers already produce an all-electric tractor that is on the market and American tractor giant John Deere has one in the works, Kanitz said. These new tractors are more than powerful to do the jobs needed on both small homesteads and larger working farms, Kanitz said. 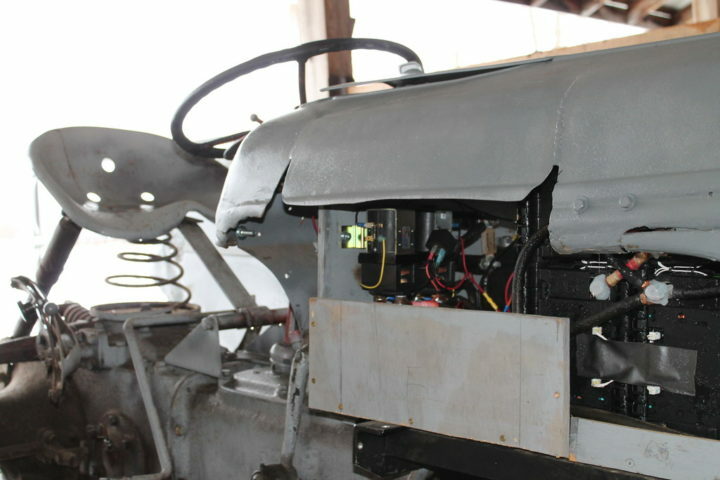 An electric actuator is the part of the motor or engine that opens and closes the valves that supply power to different implements attached to the tractor. With all that power, a 60-horsepower electric tractor can do the job of a 120-horsepower diesel- or gas-powered machine. Price-wise, Kanitz said they are about on a par with the traditional tractors. Electric tractors in the 60-horsepower and smaller range run about $500 per-horsepower, he said. The larger tractors can go as high as $1,200 per horsepower.